SIMPLIFIED ARROW SPINE CHARTS` Some arrow manufacturers have very complex charts which take many variables into account. But other arrow manufacturers offer a more simplified chart with an arbitrary number system, like the sample chart on the right which just references draw weight and arrow length. 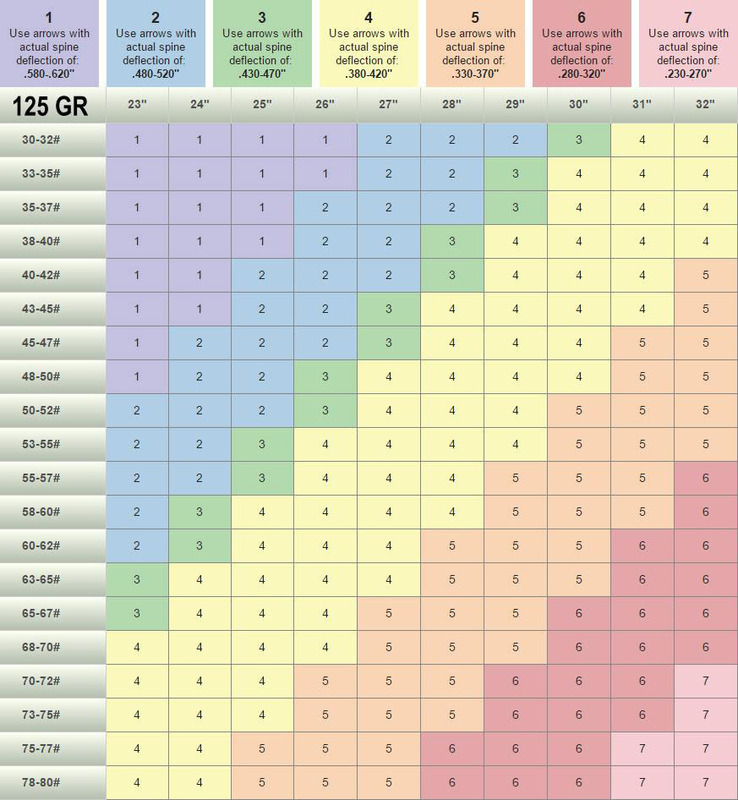 If you go by the simple chart method, then you'll need to apply a little common sense - particularly if your bow setup isn't exactly 'average'. 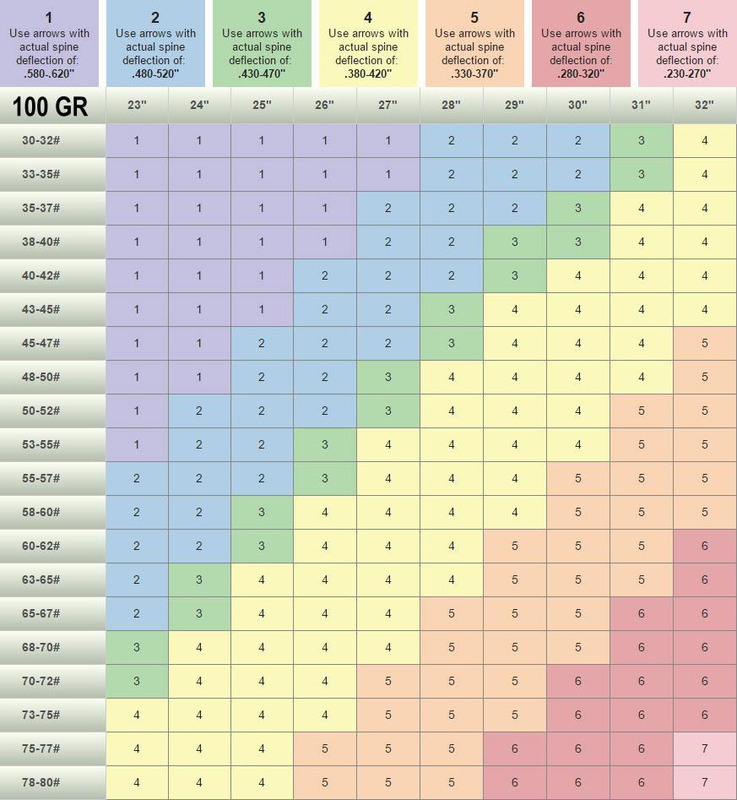 For example, if you shoot a typical 310 fps compound bow, with normal 100 gr tips and 75% let-off, the simplified chart works fine. If you know your bow is set for 60# and you use 29" arrows, you just follow the dots on the chart and choose the 2000 spine size. Easy! But what if you shoot a very aggressive speed-bow with a 350 fps IBO Speed? In that case, your bow will have more output than the average 60# bow. You might need to accommodate by choosing a little stiffer spine like the 3000 shaft, right? And what if you prefer a heavier 125 grain tip, what then? 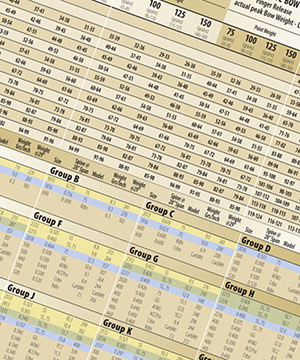 We appreciate the easy reference of simplified charts, but they're not always the best utility. If you would rather not use the simplified method, then we suggest you get to know the concept of actual spine deflection. And don't worry. It sounds a lot more complicated than it is. WHAT IS ACTUAL SPINE DEFLECTION? There is a difference in an arrow's published spine size and the arrow's actual spine deflection. Published spine sizes can be anything (a number system, color codes, letters of the alphabet, etc.) but an actual arrow spine deflection is expressed as a direct technical measurement. According to the modern standards (ASTM F2031-05) an arrow's official spine deflection is measured by hanging a 1.94 lb. weight in the center of a 28" suspended section of the arrow shaft (not to be confused with the old AMO standard of 2 lb. and 26"). The actual distance the 1.94 lb. weight causes the shaft to sag down is the arrow's actual spine deflection. For example, if a 1.94 lb. weight causes the center of a 28" arrow to sag down 1/2 inch (.500"). Then the arrow's spine deflection would be .500". Stiffer arrows will, of course, sag less. More limber arrows will sag more. So the stiffer the arrow is, the LOWER its spine deflection measurement will be. The more limber an arrow is, the HIGHER its spine deflection measurement will be. Make sure you understand the relationship of spine deflection and stiffness. A lower number is stiffer. Many customers get this backwards. For example, an Easton 340 (.340" deflection) is dramatically stiffer than an Easton 500 (.500" deflection) - not the other way around. 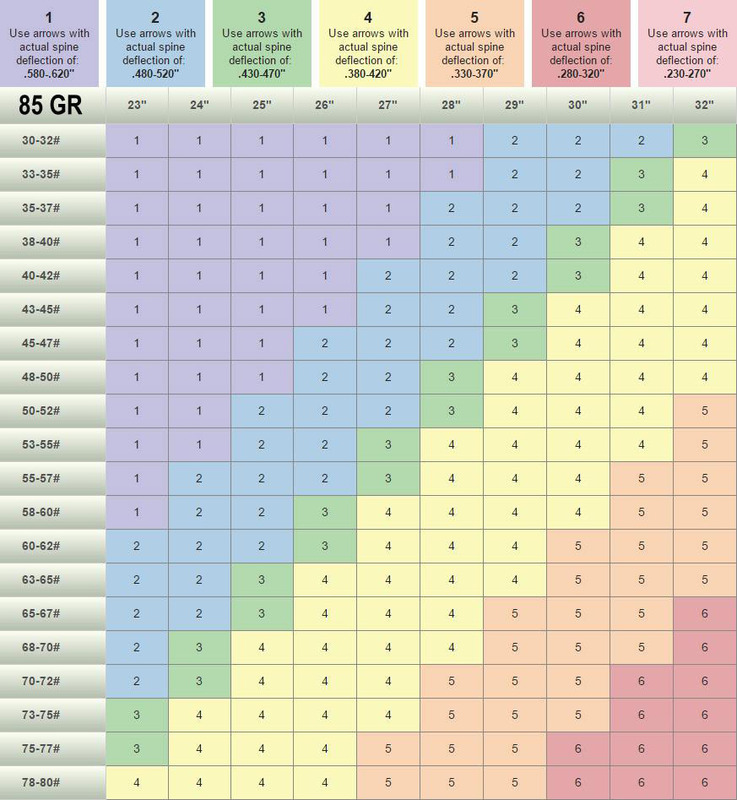 STANDARDIZED SPINE CHARTS BASED ON DEFLECTION` We suggest it is far more reliable to reference the deflection data on standardized charts. These charts are normalized for modern compound bows with IBO speeds between 280-330 fps. For faster bows, read chart one block down and to the right. For slower bows, read chart one block up and to the left. Chart not applicable for traditional bows. Again, please note actual arrow spine deflections do not necessarily match the manufacturer's marketed spine sizes. For example, a "Carbon Express Maxima 250" has an actual spine deflection of .404", not .250" as the sizing suggests. Never assume an arrow's published spine size matches the arrow's actual deflection. Look up the real deflections and base your choice on that. WHY HAVE SO MANY SPINE SIZE SYSTEMS? The next section is technically exhaustive, but worth the read. Once you know about spine deflection measurements, picking arrow shafts will be easy from now on. To understand the issue of arrow spine deflections and why they aren't just standardized, like tire sizes or plumbing fixtures, you must understand something about the history of the arrow industry. The gold standard for rating arrow spine has always been Easton's fitment charts. 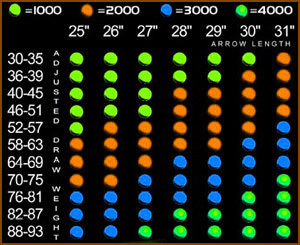 Before carbon arrows hit their stride in the 1990's, practically every archer in the world had at one time studied the little blocks on the Easton chart, trying to decide if the 2219's, 2413's, or 2315's would be better (remember?). The basic rating system wasn't really hard to understand. The first two numbers were the arrow's diameter (in x/64th's of an inch) and the second two numbers were the shaft's wall thickness (in x/1,000th's of an inch). So a 2315 was an arrow shaft with a 23/64" diameter and a wall thickness of .015". Easy enough. But what did that really mean? The rating system had nothing to do with arrow spine, directly anyway, and the numbering system wasn't necessarily sequential. A 2315 arrow was actually heavier and stiffer than a 2413 arrow. A 2219 was surprisingly heavier than a 2512, but not as stiff. And a 2314 and a 2315 oddly weighed the same but had different deflections. Okay, it wasn't so easy. But Easton's engineers crunched all the numbers and the handy aluminum arrow charts solved all the woes with their nice little organized blocks. CARBON ARROWS SCREWED EVERYTHING UP` Then carbon arrows came along and made things easier ... almost. Since carbon arrows had a much broader ranger of application, there was no need for 10 to 15 sizes of the same arrow. For most carbon arrows, 3 to 5 sizes covers virtually every application. So Easton simplified the sizing system by basing the sizes on actual spine deflections. Easton's familiar carbon arrow spine sizing system (500, 400, 340, 300) is basically the arrow's spine deflection x1000. So a 500 shaft is a .500" deflection. A 340 Easton shaft is a .340" deflection and so on. So forgiving the shift of the decimal, the Easton spine sizing system matches up nicely with actual spine deflections. Unfortunately, the system is somewhat counterintuitive. For Easton/Beman arrows, the lower numbered shafts are actually the stiffer heavier shafts, and the higher numbered shafts are the more limber and lighter shafts. This naturally goes against the bigger is more line of thinking. Since most people don't know how spine deflections are obtained, or why they matter, some archers will simply buy the "larger" size for heavier bows and "smaller" sizes for lighter bows. Of course, this is completely backwards. So everyone ended up back at the Easton charts studying the little blocks again. And why not? No archery pro-shop is complete without a big Easton chart on the wall. So why mess with tradition? CARBON ARROWS TAKE COMMAND OF THE MARKET` Turns out, Easton wasn't the only player in the carbon arrow game. In fact, they were one of the last to join-in when they purchased Beman in 1995. By that time, Gold Tip already had a five year head start with their popular graphite arrows. And Gold Tip had really simplified things with an easy 3 size system, the famous 3555, 5575, and 7595. The system was intended to be self-explanatory. The 3555 roughly fit a 35-55# bow, a 5575 fit a 55-75# bow, and a 7595 fit a 75-95# bow. At least that's how most archers understood the sizing. But it didn't always work out that way. The Gold Tip arrows had spine deflections of .500" (3555), .400" (5575), and .340" (7595) respectively. So for example, a 53# bow shooting a 30" arrow actually required the 5575 spine (per the Easton gold standards anyway) instead of the 3555 that Gold Tip's sizing convention might suggest. So it wasn't long until Gold Tip published their own charts (yes, with the little blocks), based essentially on the Easton spine deflection data. To be fair, Gold Tip's system really wasn't so bad, comparatively anyway. There was worse to come. MUDDY WATERS` Not to be outdone, Carbon Force Arrows, a division of PSE, decided to really simplify things and make their sizes completely sequential ... 100, 200, 300, and 400. So the larger the number, the heavier and stiffer the arrow. Fine! But this scrambled all of our brains even worse because their arbitrary sizes actually overlapped the actual arrow deflections. The Carbon Force 100 has a .500" spine, the 200 has a .400" spine, the 300 has a .340" spine, and the 400 has a .300" spine. Try to wrap your noodle around that! And just as our grey matter started to congeal from Carbon Force, Carbon Express reinvented their generally understandable 30/50, 45/60, 60/75 system (similar to Gold Tip's system but with the same drawbacks) to a system that's not just arbitrarily sequential (150, 250, 350), but varies from shaft to shaft. Their Maxima 250, for example, has a spine deflection of .404", but the Maxima Hunter (camo) 250 has a spine deflection of .417". Oh boy! ALL CROSS-REFERENCING LEADS BACK TO EASTON` We're not trying to toot Easton's horn, but it boils down to this. Whether you like Easton arrows or not, Easton is the big dog in the arrow market. And Easton's competitors don't want to be seen as "copycatting" Easton by following Easton's sizing format. They want to be unique and develop their own marketing and sizing system for their products, even if it ultimately leaves us all confused. There are well over a dozen popular carbon arrow manufacturers who sell carbon arrows in the U.S., and all of them are trying to sing their own tune. Just imagine if you went to buy a new set of P225/60R17's for your SUV but the various tire brands were sized using different systems (Red60-400, 6022/175, SUV522/6017). Absurd, right? It would be a nightmare behind the counter trying to cross reference all that. But that's exactly how we do it in the archery industry. It's still the Wild West in our little niche market and everybody wants to be the new sheriff in town. For archery enthusiasts this is both good and bad. Competition and innovation will continue to keep prices low and product quality high, but we'll all have to continue to put our thinking caps on when we shop for arrows. NO UNIVERSAL SYSTEM - GET USED TO IT` There are no universally agreed spine sizes among the various arrow manufacturers. 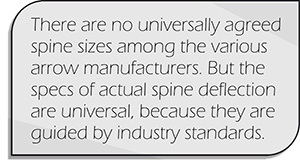 But the system of actual spine deflection is universal, because those measurements are guided by industry standards. That's the only apples-to-apples system that applies to every brand and model of carbon arrow. As long as the various carbon arrow manufacturers provide their spine deflection data (and they test using the industry standard method), manufacturers can size and market their arrows by any system they like, and we can still reference the proper application from the gold standard Easton charts using actual spine deflections.